True Story – this precious pie was supposed to be Sunday’s Dinner Dessert, but after whipping up the tasty filling, I dropped the whole damn pie crust! I was so mad, but refused to leave to buy another one. So yesterday, on my lunch, I was on a mad hunt to find the Oreo Cookie Crust that takes this tasty treat over the top! My co-worker made this pie and shared it with us at the office and was nice enough to share the recipe after I inquired. 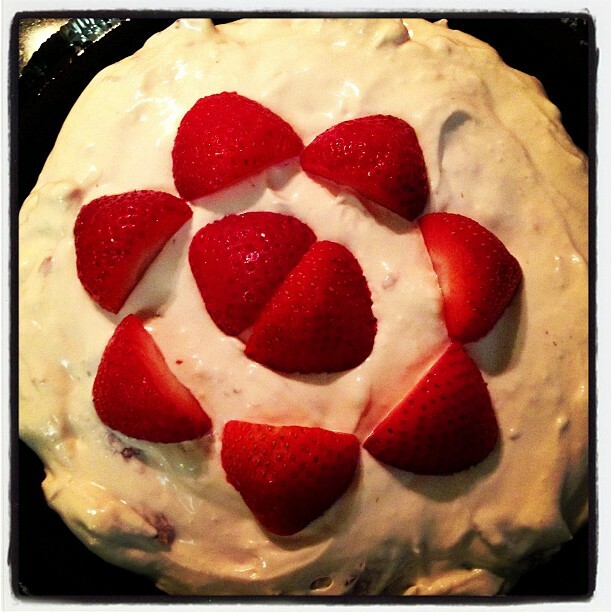 Mix Cream Cheese and Confectioners Sugar (I used electric mixer); add Cool Whip and Strawberries and mix well by hand. Put in crust and garnish with Strawberries. Mods: I used an Oreo Cookie Crust, that I could not find in my local Publix, but it was in Walmart. I have a work potluck next week…is this prize winning? It’s pretty tasty to me! You will probably need to double the recipe so you can have 2 pies!